As the fall 2014 semester gets under way Aug. 21, the university anticipates an enrollment of more than 82,000 undergraduate and graduate students – a new record for the number of students enrolled and a nearly 8 percent increase from last year. Increases also are seen in the number of transfer, international and veteran and veteran-dependent students, and the student body is the most diverse ever. Preliminary first-day enrollment shows records set across nearly all areas. Undergraduate enrollment grew to 66,309 and graduate school enrollment grew to 15,751, for a total of 82,060. Getting ready to start the school year is Preston Adcock, from Glendale, Arizona, a junior life sciences major in the New College of Interdisciplinary Arts and Sciences and a Barrett Honors student. He has his dream set on going to medical school and working as an orthopedic surgeon or in emergency medicine. He is working in ASU professor Carl Wagner’s organic chemistry lab. Freshman enrollment this year grew to more than 11,000. Applications received were more than 46,000, a 25 percent increase over the previous academic year. The fall 2014 freshman class is an academically strong group, with an average high school GPA of 3.4 and average SAT score of 1113. More than half, 54 percent, are New American University Scholars at the Dean, Provost and President Scholarship levels, the most prestigious scholarships for first-time freshmen. Transfer enrollment has grown to more than 8,800 – up nearly 13 percent from fall 2013. The transfer class is academically strong, with an average 3.1 transfer GPA. Jonathan Williams transferred to ASU from Glendale Community College in Glendale (metro Los Angeles), California. He is currently studying communications but plans to switch to journalism to pursue his career goal of becoming a sports journalist. He learned about the Walter Cronkite School of Journalism and Mass Communication from friends at a USC football game and decided to apply because “it’s better than the state journalism schools in California.” He’ll be working as a news reporter at the State Press this semester. "I'm looking forward to the resources at a major research university and delving into writing and photography as part of my job at the State Press,” Williams said. "For me, writing is a passion, and I want to be a journalist because I want to be able to write about what's important and going on in the world, and keep people informed." International campus-based enrollment increased 33.6 percent to 8,787 students. 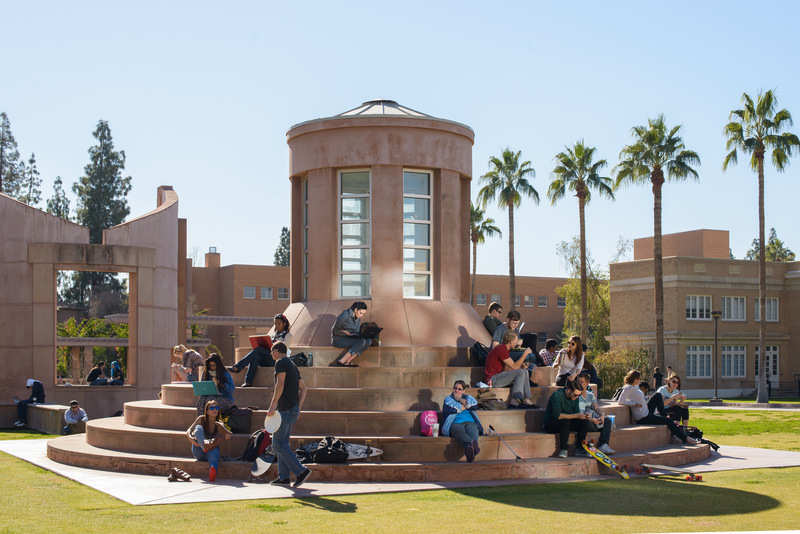 The top 10 countries for international enrollment at ASU are China, India, Saudi Arabia, South Korea, Canada, Kuwait, Taiwan, United Arab Emirates, Qatar and Mexico. In addition, some 600 Brazilian students are calling ASU their educational home for the next academic year through their government-sponsored Brazil Scientific Mobility Program. Viswajith Hanasoge Nataraja, from Bangalore, India, is pursuing his master’s degree in mechanical engineering at the Ira A. Fulton Schools of Engineering, and his area of interest is fluid mechanics and energy. He is a student worker in the University Sustainability Practices office, is actively involved in the Zero Waste at ASU initiative and is vice president of the Indian Student Association at ASU. Patrick Harris, a senior airman in the Arizona National Guard out of Tucson, Arizona, is majoring in music education with a minor in youth services leadership. A sophomore from Newport News, Virginia, who served in the Air Force for four-and-a-half years, he found through research that ASU is one of the top schools for supporting military veterans and for music education. "The experience at ASU has been getting even better, especially as I take advantage of the opportunities to get involved in activities and organizations. I'm part of the Sigma Alpha Lambda fraternity, and am involved with the marching band at Marco de Niza High School in Tempe, Scottsdale and Mesa Community Colleges' bands, and Sonic Brass Band,” said Harris. "I've always wanted to teach music, and knew that I needed a degree to do so. I wanted to put in the work to achieve my dream." Arizona State University is accepting registrations this month for students and families to participate in the Future Sun Devil Families program. Arizona State University is accepting registrations this month for students and families to participate in the Future Sun Devil Families program. The program guides students and parents through the college preparation process at no cost. During its first year, Future Sun Devil Families offered the curriculum to 9th grade students and their parents, with plans to add additional grades each year. This year, both 9th and 10th grade curriculum is being offered. Students and at least one parent or adult who supports their goal of acquiring a university education are encouraged to attend the workshops at local high schools. “Future Sun Devil Families illustrates ASU and President Crow's vision to measure the success of our university not by who we exclude, but by who we include and how they succeed,” said Sylvia Symonds, assistant vice president of educational outreach at ASU. Future Sun Devil Families workshops are taught in English and Spanish, take place during the academic year and are available at no cost to families. Workshops are designed to guide students and parents through the college preparation process in an interactive, co-learning environment. For more information and to register, visit: asu.edu/futuresundevils.